For Swine: Control of porcine proliferative enteropathy (PPE) associated with Lawsonia intracellularis infection in groups of swine in buildings experiencing an outbreak of PPE. Feeding Directions: Feed the resulting Type C medicated feed containing 38.6 grams tylvalosin/ton as the sole ration for 14 consecutive days. CAUTION: To assure both food safety and responsible use in swine, concurrent use of tylvalosin Type A medicated article in medicated feed and tylvalosin or another macrolide in medicated drinking water or by any other route of administration should be avoided. Not for use in swine intended for breeding. The effects of tylvalosin on swine reproductive performance, pregnancy, and lactation have not been determined. VFDs for tylvalosin shall not be refilled. Mixing Directions: To prepare one ton of complete Type C medicated feed containing 38.6 grams per ton (42.5 ppm) tylvalosin, thoroughly mix 20 pounds of this medicated feed with 1980 pounds of non-medicated feed. Pelleted Type C medicated feeds must bear an expiration date of 30 days after the date of manufacture. Crumbled Type C medicated feeds must bear an expiration date of 7 days after the date of manufacture. ANTIBACTERIAL WARNINGS: Use of antibacterial drugs in the absence of a susceptible bacterial infection is unlikely to provide benefit to treated animals and may increase the development of drug-resistant bacteria. USER SAFETY WARNINGS: Not for use in humans. Keep out of reach of children. May cause skin irritation. Tylvalosin has been known to cause hypersensitivity reactions in laboratory animals. People with known hypersensitivity to tylvalosin should avoid contact with this product. In case of accidental ingestion, seek medical attention. No withdrawal period is required before slaughter for human consumption. Different withdrawal times may be required for certain export markets. Net weight 40 lb (18.1 kg) Bag. 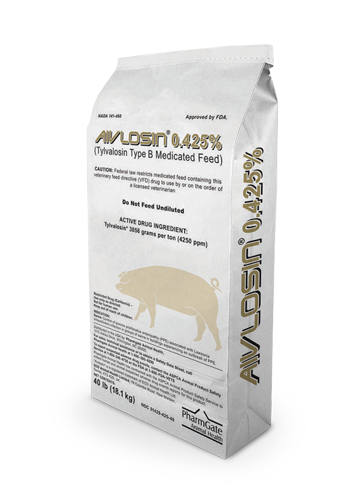 Formulated for optimal dispersion, segregation, and stability in feed. Type B medicated feed for use in the manufacture of Type C medicated feeds for swine. Category I drug; does not require a feed mill license. Veterinary feed directive required: Federal law restricts medicated feed containing this veterinary feed directive (VFD) drug to use by or on the order of a licensed veterinarian. Store in a cool dry place at or below 77ºF (25ºC).